Steve Christensen mixed the bejesus out of Trystan Layne's last 3 songs. I produced Fade Away. Josh and Averille did an acoustic version of the same as well as a beautiful tune called Victims of the Way. I was really surprised at how quickly the tracking and production went on Fade Away. The guys stuck with some of their early, intuitive performances, which resulted in a track that is tight, focused, and rocks. I think that Averille and Adam were a bit freaked out when I kept telling them they had it nailed quickly on their parts. I KNOW that Josh Applebee was. We came in to track the drums and Josh had everything roughed in on mic ideas and preamps already. We spent an hour setting up, brought up the faders and the drum sound was just there. I believe we repositioned a hat mic, and that was it. Scared Josh to death---he's normally extremely meticulous in setting up the drum recording (read: slow as Christmas -- but worth it). Funny thing, I actually bitched out Josh because I thought he was late for the session,... when it turned out he already had everything done the night before. DOH! Rich Whiting and finished our project with JJ Worthen. Look for a song or two to be on the Sound Board in the next few days. JJ's project was so good, that I'm left with that super empty feeling, "... certainly we have more stuff to track,... don't I have another part to play?..... Isn't Trystan Layne doing something with me today,...?" JJ, Rich and I are going to work on some new arrangements just so I don't slide into a black depression. Anne Loo is threatening to get her juggernaut of project duplicated and done. I can't wait to post the art work. Team Jarvis/Workman/Loo/Christensen are meeting regularly to keep the torch lit. I'm working on Sarah Sharp's next record with Kevin Ryan, and I met up with Maggie Walters to do some songwriting while I was in Austin. Working with Sarah is so natural that I forget that it's work. My connection with Maggie is still just as strong as when we last worked together. By the way, she has an album in the can produced by Paul Leary. I have heard one track from it and if the rest of the CD is as good as what I heard there will be a lot people talking about it. Check her out on her site for release info. It'll be one of those CD's that I wish that I did. Bam! 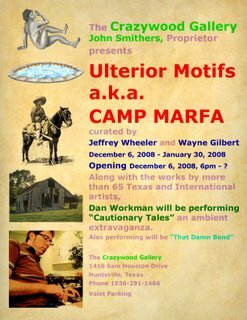 I'm playing another ambient music performance under the name 'Cautionary Tales', for a Wayne Gilbert curated art show. 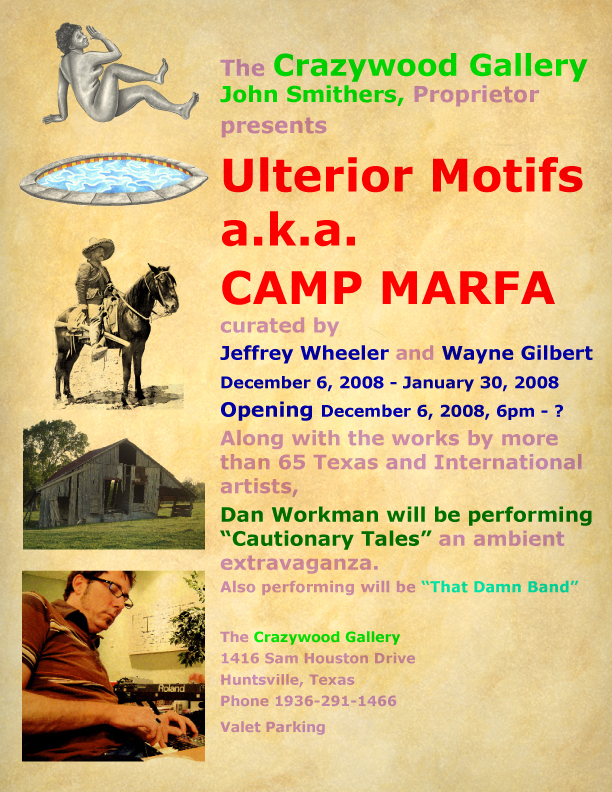 The first of the series was in Marfa, Tx. during the famous Chinati Weekend Open House in October. Next stop, Huntsville. The visual art alone is worth the trip.